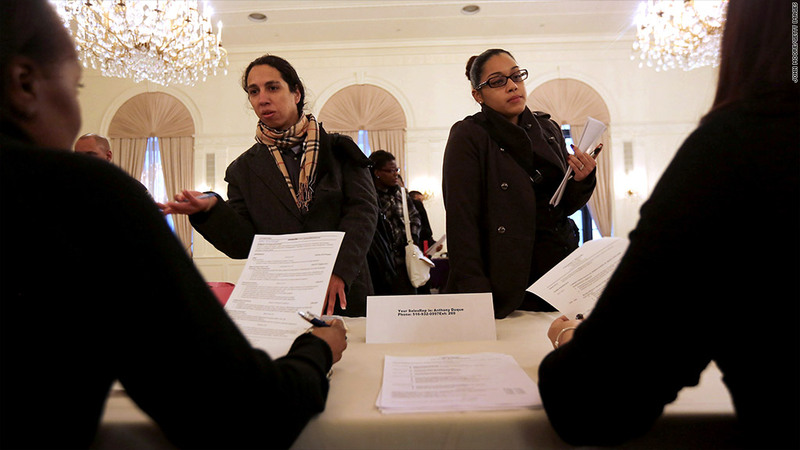 Applicants meet potential employers at a job fair in Manhattan, earlier this month. First-time claims for unemployment benefits fell last week, and are now back to pre-hurricane levels. About 343,000 people filed initial jobless claims last week, 29,000 fewer than those who sought help in the previous week, the Labor Department reported Thursday. Economists surveyed by Briefing.com had expected claims to tick up to 375,000. Superstorm Sandy put many workers temporarily on unemployment benefits, leading claims to surge in mid-November, but now the weekly figures are back to levels consistent with modest hiring over the past few months. Economists often prefer to look at a four-week moving average, which smooths out the volatility in the weekly numbers. That average fell to 381,500 last week, after also spiking in the wake of Superstorm Sandy. The report also showed 3.2 million people filed claims for their second week or more of jobless benefits during the week ended Dec. 1, down 23,000 from the previous week. Last week, the Labor Department reported that employers created 146,000 jobs in November, roughly in line with average job growth over the last 12 months.